Our Bedouin-inspired stretch tent range is not only functional, protecting one from the elements, they also create welcoming spaces that bring people together and create an intimate, relaxing atmosphere. 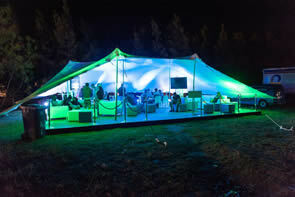 Dimensions Tents + Structures has been in the industry for many years. Our focus is on attention to detail and reliability – from the quality of the tents to the commitment to perfection on the day. We understand that important events such as your wedding day are some of the most important days of your life. That is why, with timely and reliable service, we let you focus on your big day, whatever the occasion, while we worry about the details. CREATE THE FUTURE WITH YOUR NEXT PARTY OR EVENT, GET A QUOTE. When it comes to any event, safety is our number one priority. We use only the best (and cleanest) fabric that is pre-treated with a water repellant, anti-fungal agent and Teflon finish. Our bespoke products have been manufactured to ensure the stretch tents are incredibly malleable and have the strength to be fitted almost anywhere, transforming a space. With such a fluid and dynamic structure the space will exude elegance while remaining 100% functional and safe. With our wide range of tents and structural solutions, we will undoubtedly be able to create the ideal space no matter how big or small your wedding. 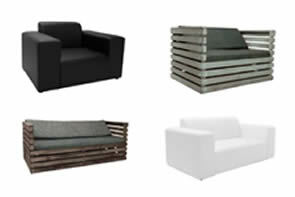 We also have many colours to choose from so that it can be sure to match the rest of the décor and meet your individual needs. 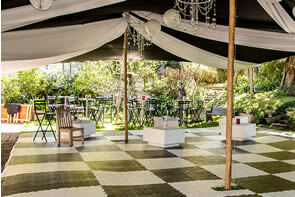 Above the tents, we also supply dance floors, outdoor heaters and furniture for ambience and convenience. On the big day, our experienced team will securely set up the high quality stretch tent that will provide protection from rain, harsh winds, or even keep the air cosy on a cold night. No matter the weather, you can be sure the festivities will continue with peace of mind.